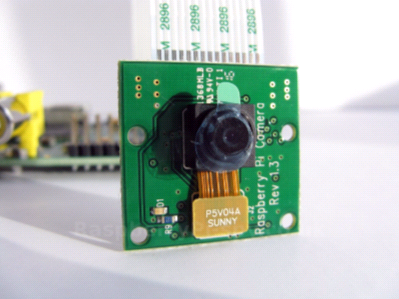 We’ve just spotted a third-party add-on for your Pi and Camera Board which we think you’ll find really useful. The ribbon cable that comes with the Raspberry Pi Camera Module is, for reasons of signal integrity, not very long. In most cases, that doesn’t present a problem. But if you’re wanting to take pictures of something that has to be a distance from your Pi – some fiddly nature photography setups are a good example – the length of that cable can be a nuisance. So the good folks at Petit Studio have made a useful HDMI extension kit. Both the Camera Module connector and an HDMI connector have four data buses made by pairs of cables with a ground shield, which means a small converter can be built: they’re offering two little PCBs which attach to the ribbon cable and to the back of your camera board, with an HDMI cable bridging the space between them. The makers have tested the setup with 5m HDMI cables, and the picture quality is not affected (you won’t be able to run this with an infinitely long HDMI because eventually the signal will degrade); you should be able to use a longer cable too, but you’ll need to experiment. Perfect if you want to put a camera on the roof when your Pi is in a bedroom, or if you need to put somewhere inaccessible to use as a camera trap, but want to be able to get to the Pi itself easily. We’re pretty sure a lot of you will find a use for this kit. You can buy your own for about £10 at Tindie. We love it. Simple and very, very useful. Thanks Petit Studio! Love it, just bought 2! I want a doorbell camera that proves (or disproves) the courier even TRIED to deliver. That’s one of the main reasons I made the Pi Powered doorbell in the first place….other than the doorbell sounds like a next gen star trek doorbell with the ability to perform differently on special days like known birthdays. There’s also room for improvement with face recognition in the furture. Does anyone have contact details for Petit Studio (other than via Tindie). I’d love to see these stocked in the UK! Annoyingly, no; I was looking for a contact to let them know about this post. Let me know if you find anything! Just to be clear, this is just a passive adapter, so its not converting the camera signal to HDMI. I.e. if you used this to connect the camera directly to a TV, or the HDMI port on a PI, then it would not function and could perhaps damage the camera or device. I could “iron out” the wrinkle of the common ground found on some micro HDMI cable. For these cables there is only one GND line in addition to the main shield and the metallic part of the HDMI connectors on both sides; with this kit you can make a bridge of solder between the hole labelled GND (on the right side of the board) with the metallic HDMI connector and the whole will be put to GND. I expect this to work for most of the cables. I’ve been using one of these for the last week or so. Nice solid bit of kit that is easy to put together. I’m using a cheap Poundland (Dollar Store) HDMI cable and it works well, no loss of quality and I now have 2 metres of wire for my Raspberry Pi Camera. I popped into Cyntech’s office a couple of weeks ago to discuss this and they seemed interested in the product, suggesting that if I were to come up with a design and was able to spread the word via social media and the like, they would be happy to manufacture and distribute and provide me with a commission. As this is not my design, I was unable to take them up on the offer, however FredD may want to take them up on the offer. Cyntech are the people who make the HDMIPi among other things and they have a facility in Chicago, Illinois as well as in the UK. FWIW- using the HDMI cable is more convenient in many cases. But not all cases! 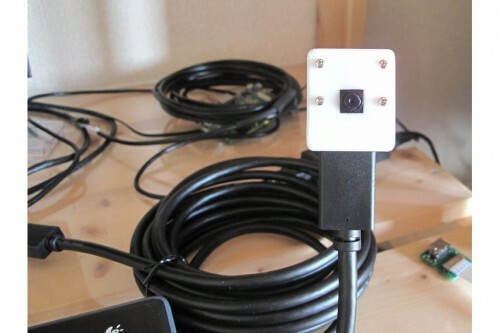 I was able to install a camera on an outside wall with the pi inside the garage without drilling any holes, because there was just enough space between boards near the roof eaves that the flex cable could pass through the thin sliver of a gap. I couldn’t see any daylight there and didn’t think it would work, but I tried poking the cable along the end of the board and it slid right through. A bit awkward to reassemble the RPi case + flex cable in a tight corner over your head- but possible. Including four user lines and easy access to supply and ground are inspired moves, too. Makes it easy to power a sensor, actuators or whatever at the camera head end without any extra cabling. Brilliant. Do we know if this would work with a multi-HDMI splitter, so that multiple cameras could be attached to the one Pi? This should be great for the Outdoor Learning Center at our school. We can place the camera at a high overlook site to record the action of wildlife in the off hours. With the RPi, it will not be too difficult to set up a trigger mechanism. Bought one : works well. Is there any way to tell what HDMI cables have the data shield? I tried the one I had and then went and bought one; still no luck. I’d like to find one that does it natively w/o having to do the “trick”. Most of the cables have info printed on the side… not sure if that’s where I need to look. Any help, as always, appreciated. I have purchased one of these, it didn’t work so I returned it and received a replacement kit. This failed to work, so I put the solder bridge between the 0v and the outer shield of the HDMI connector, the camera is till not being detected. I have a cable that includes ethernet compatibility from Amazon (CSL – 5m Ultra HD High Speed HDMI cable 1.4a / 2.0 Ethernet (Network) & Real 3D capable / FULL HD TV / x.v. Color and Deep Color / ARC – CEC / Standard 1.4a/2.0 | 1080p / 2160p | 4k | 5,0), is it this that is causing the problem? Likewise, I recently purchased the HDMI adapter kit and am having similar problems. I’ve tried several HDMI cables with the outer shield grounded (one type had High Speed HDMI Cable with Ethernet stamped on it) and none of them worked.